This restaurant gave us a very good time and after looking on their website, I realised the owner was speaking to us the entire evening! So just as the title suggests, this was a schnitzel challange. 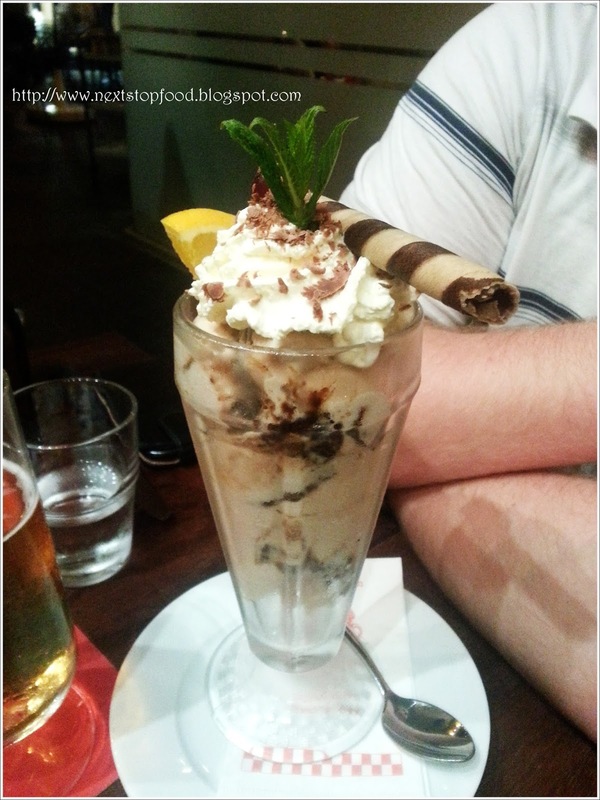 My colleagues thought it would be a good idea to go to this restaurant and attempt to do this challenge. We had to book the Challange on the phone prior to arriving, so they could prepare the food. 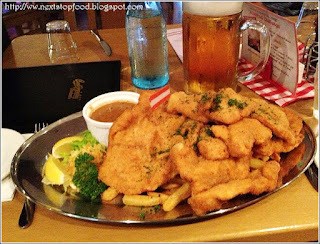 THE CHALLANGE: 1KG of schnitzel + Chips + Choice of Sauce+ 1 Litre of beverage (beer or soft drink) all of this in one hour. THE PRIZE: FREE dessert and a FREE T-Shirt. Now just a tip, the staff did mention that you can drink the 1 Litre of beverage prior to the meal. They said its mainly about the food. Also if you're interested in this challange, if you are able to beat the record you get this meal for FREE. The Record: Daniel Mercer previously finished the entire Schnitzel+chips+drink in 12 Minutes. Our very friendly waiter informed us that the guy was a professional eater and he has returned to attempt to beat his record. He will return in the future to attempt to eat 2 schnitzel challanges in a row! Now to make it clear, I did not do the challange myself, my 3 colleagues however did. Watching them was enough entertainment for the entire evening! Once the food came out, they were ringing a bell, everyone was watching us, the spotlight was on our table. The food was HUGE! As they placed the food on the table, the size was astounding! 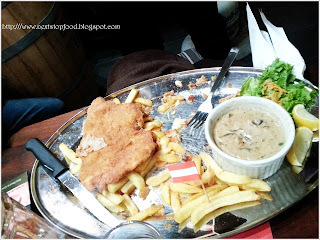 Plenty of thick schnitzel and plenty of chips! Now my colleagues were planning all day strategies, eating salad for lunch and chewing gum. Once they saw the meal, they didnt have time for cuttlery, they just dug in! The hour passed and all 3 colleagues were struggling. the contestants were 2 males and 1 female. They all had a great attempt! But due to all their efforts, no one was able to finish in the hour, the staff even came out to tell us they gave us an extra 5 minutes. 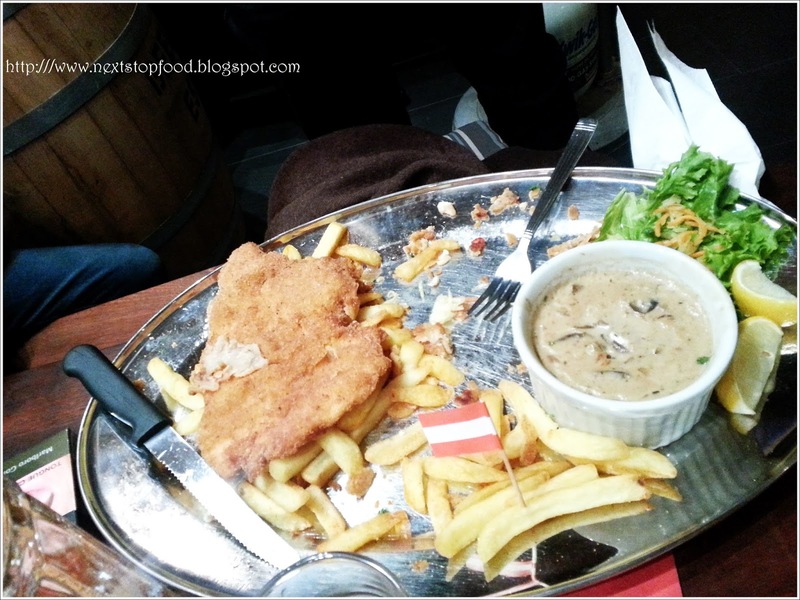 While the 3 contestants were doing the schnitzel challange, my partner and I tried their other dishes. Cordon Bleu $23.90 (Stuffed with ham and swiss cheese, crumbed and shallow fried. Served with lemon wedges) and the Hawaiian Schnitzel (Meat of your choice crumbed, fried and topped with Pineapple rings and Swiss cheese, and oven baked). 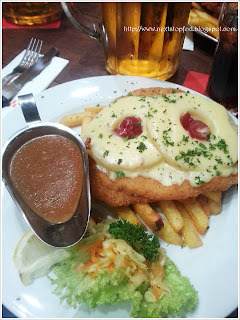 The schnitzel at this restaurant was very delicious. We even had dessert Coupe Black Forest (Hot cherries poured over vanilla ice - cream, topped with whipped cream, grated chocolate) and Gelato of the day (Tiramisu), these were very tasty and the presentation was amazing. All in all, the food was very delicious. The glasses of 1 Litre of beer were HUGE. 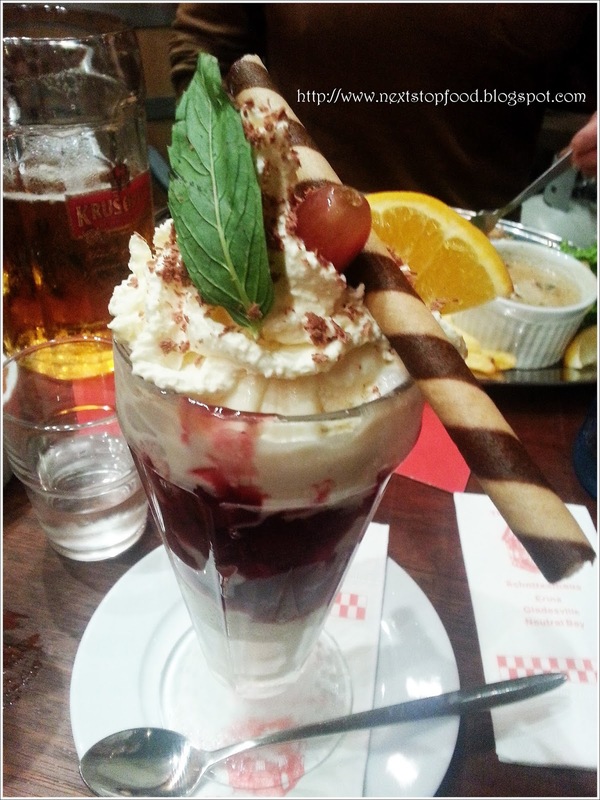 the schnitzel was thick, tender and HUGE, Dessert was delicious. The service was great and they even let me ring the bell when they brought the schnitzel out. 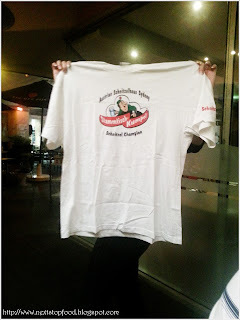 The staff checked on us regularly and even pulled out the winning shirt to show us and entice the team to eat more. Even without realising the owner was chatting to us the entire evening, checking if the meal was ok and if we were satisfied. Gerry if you are reading this blog, thank you for the fun evening and thank you for being a great host! wow what a challenge. id prefer to be the ones watching tho. this is insane! and pineapple on schnitzel? what a brilliant idea!